Do I need shielded speakers for my PC? Only if you still game on an old CRT and use floppy disks. I'm a huge fan of headphones, as some of you might know. However, nothing can beat the visceral experience of having a good set of powerful speakers. Most people choose to go with PC speakers, but for those who want a bit more fidelity and punch, home-theater bookshelf speakers are the way to go. There's only one issue: almost all home-theater speakers are unshielded. But is this really a problem? Shielded speaker drivers have a housing around the voice coil assembly. It's generally known that speakers, especially large ones, have huge magnets inside of them that drive the movement of a speaker's cones. And it's generally believed that having powerful magnets next to computer gear can be a recipe for disaster. However, unshielded speakers were more of an issue back in the days when everyone was using a CRT monitor—you know, those huge displays that you don't really see anymore. CRT monitors were easily affected by magnets, even small ones, which when placed in close proximity to the display would cause color and image distortion. LCDs however, are immune to such effects. In this case, you don't have to worry about what type of speakers you place next to your display. But what about your PC? Aren't hard drives affected by magnets? Actually, yes and no. Despite what the general public believes, hard drives are fairly resistant to magnetic fields from common magnets. In fact, hard drives have two very powerful rare earth magnets inside of them that are crucial to controlling their read/write actuators. If you've ever taken a hard drive apart, you'll know that the two magnets inside are dangerously powerful. The actuator magnets actually sit right next to the platters. It is highly unlikely that placing your PC next to a home-theater speaker will impact it in any negative fashion. So you're telling me that I can't erase a hard drive with some powerful neodymium magnets? No. In fact, you can stick two powerful magnets on either side of a hard drive, turn the drive on, and operate normally without errors. This has to do with the coercivity of the materials used for a hard drive's platters, which is the measure of the material's resistance to changes in magnetization. Platters have very high coercivity and require exceptionally strong electromagnetic fields to change. If you want to scramble the data on a hard drive, you're better off taking a hammer to the thing instead of using magnets. We no longer live in a world of fat CRTs and floppy disks. 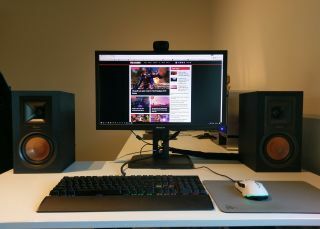 So go ahead, grab some monster sounding speakers and use them for gaming, music, and movies. They'll sound better than any PC speakers you can buy.